The designation “alien fish” is given to any fish species that is not native to British Columbia. If they are not native then how do they get here? Some fish species have been legally introduced many decades ago for a variety of reasons- mostly for commercial purposes. Others have been introduced illegally, meaning they have been transported from their natural habitat and released in our waters or are disposed-of pet fish, such as the snakehead and the Asian carp. While not all alien fish species pose a problem to our native fish and aquatic animals (such as crappie and other members of the sun fish family), some do. The small and large mouth bass can become problematic if their numbers take over a smaller body of water. Even worse, the Snakehead, a ferocious predatory fish from Asia, can literally wipe out native fish species in a matter of just a few years and pose a serious risk to other species such as ducks, beavers, muskrat and frogs that live a great part of their life in the water or on the water surface. Angler’s opinions are divided whenever alien fish species come up in a discussion. There are those that accept them as a welcome addition to the angling sport and others that feel the government should undertake every possible effort to destroy these alien species. Interestingly, the latter segment of anglers often refuses to target alien fish. Yet, if they are that concerned they should try to catch as many of these fish as they can thereby doing their part to reduce the population. I am one of those anglers that welcome some of these alien fish species as an additional fishery to our native species. Having lived for a number of years in America before making Canada my permanent home I became quite fond of fishing for crappies, large and small mouth bass. There are several lakes in our region that hold small to good populations of these two species and if you’re willing to travel to the Lower Mainland there are even more lakes and streams with good populations as well. Crappies are not only fun to fish they are also among the best-tasting fish and with generous bag limits of up to 20 per day in regions 2 and 8 you’re bound to stock up on your fish supply fast. While spring and fall are the best times for fishing this species they are active in summer as well. Crappie live and travel in groups, so chances are that if you catch one there will be others around in that vicinity. Crappie love structure such as weed beds, submerged trees, rock piles and other forms of cover. Finding structures like these are a good start to begin your fishing day. Crappies have a very small mouth and hits are not often that obvious. Choosing the right equipment is important. My favourite is a light seven foot rod fitted with a small reel filled with 4 to 6 pound test line. Hook size should be small too, not larger than a number 8 hook. 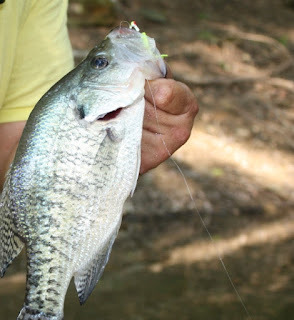 Crappie can be attracted with a variety of lures ranging from plastic baits over small spoons to spinners and live bait, such as worms, maggots and, where legal, live minnows. My personal favourite are small jig heads in various colors tipped with 1 to 1 ½ inch plastic curly tails and other plastics that imitate live food sources. Depending on the situation I may use the regular jigging method or float jigging. Other methods such as trolling, casting and retrieving or the good old float fishing can work just as well. Give fishing for alien fish a try this summer. Be aware though, you may get hooked on it. Talking about fishing; I would like to remind you all that this coming Sunday (June 19th) the Nicola Valley Fish & Game Club hosts their annual Father’s Day Fishing event. This great family fishing event is held at the children’s pond between Kentucky and Alleyne Lake. The event begins at 9 am until 2 pm. There will be lots of prizes available for the children plus refreshments and a fish cleaning station where children can learn how to safely clean their catch. At the event there will also be volunteer instructors in attendance to assist newcomers to the fishing sport with useful tips and hands-on-expertise. This is a great event for the entire family to enjoy and have a great time.